Diffusion is a mass transfer phenomenon that causes the distribution of a chemical species to become more uniform in space as time passes. In this case, species is a chemical dissolved in a solvent or a component in a gas mixture, such as the oxygen in air. The mass transfer of a species is the evolution of its concentration in space and time. If the concentration of a species is initially not uniform (the concentration might be greater in one region of a vessel than another, for example) then, over time, diffusion causes mass transfer in favor of a more uniform concentration. The driving force for diffusion is the thermal motion of molecules. At temperatures above absolute zero, molecules are never at rest. Their kinetic energy means that they are always in motion, and when molecules collide with each other frequently, the direction of the motion becomes randomized. In most cases, these collisions are common; even in air at atmospheric pressure, which hardly seems a "dense" fluid, each molecule collides with a neighbor every few nanoseconds. When molecules are moving but also constantly changing direction, diffusion occurs because of the statistics of this movement. The image below shows a volume of a solution in which there is a nonuniform concentration. The red color indicates a high concentration of solute, whereas the blue color indicates nearly pure solvent. The size of the arrows indicates the number of molecules randomly moving in a given direction from a given point. The size of the arrows indicates the number of molecules randomly moving in a given direction from a given point. Number of molecules moving right across the central boundary and left across the central boundary when the concentration profile is nonuniform. Number of molecules moving right across the central boundary and left across the central boundary when the concentration profile is nonuniform. This is not because the molecules "prefer" to move in one direction, but just because there are more of them on one side of the boundary than the other. 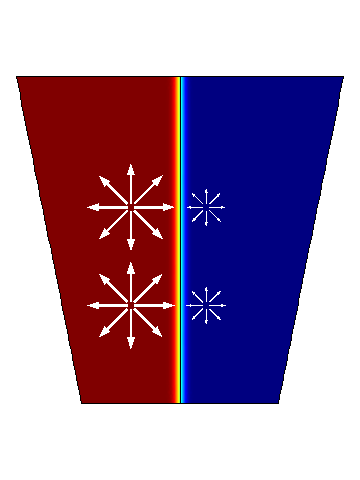 As a consequence, there is a net flux of material from left to right. This is diffusion. In this case, mass moves from left to right so that the concentration becomes globally more uniform. Because diffusion drives a net flux of material from regions of high concentration to low concentration, we often speak of diffusion as acting "down a concentration gradient". Number of molecules moving right across the central boundary and left across the central boundary when the concentration profile is uniform. Number of molecules moving right across the central boundary and left across the central boundary when the concentration profile is uniform. Even though the molecules are in random motion, there is no statistical driving force for them to start accumulating anywhere if their distribution is uniform. There is no net flux or change in concentration. Although diffusion occurs because of statistical effects, when modeling diffusion, we normally use continuous partial differential equations (PDEs) to describe this statistical process. The relation of the above statistical process to the observed macroscopic phenomenon of "diffusion down a concentration gradient" was elucidated by Albert Einstein in one of his annus mirabilis papers of 1905 (3). There, he considered the related phenomenon of Brownian motion, i.e., the random motion of suspended particles like pollen grains. The PDEs used to model diffusion problems might include Fick's laws, the convection-diffusion equation, or more complex methods for concentrated mixtures, like Maxwell-Stefan diffusion. Fick's laws contain only one parameter: the Diffusion Coefficient. This is the measure of the rate of the diffusion process. 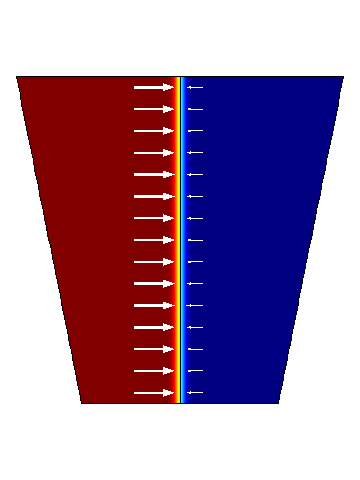 For finite vessels or sources, it is possible for a steady but nonuniform concentration to be attained. 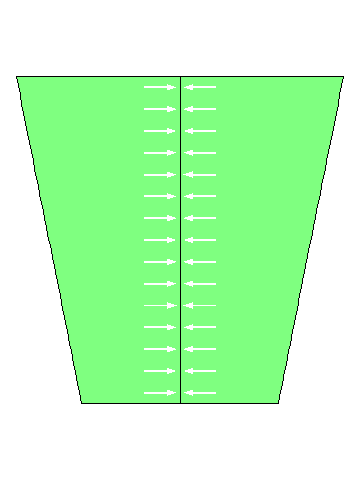 One example is diffusion to a disk at which mass is sunk. Here, a steady hemispherical concentration profile will arise after some time — as long as we keep supplying mass to the system. P. Atkins and J. de Paula, Atkins' Physical Chemistry, 8th ed., chapter 21, Oxford University Press, 2006. L.D. Landau and E.M. Lifshitz, Fluid Mechanics, 2nd English ed., chapter 6, Elsevier, 1987. A. Einstein, "Über die von der molekularkinetischen Theorie der Wärme gefordete Bewegung von in ruhenden Flüssigkeiten suspendierten Teilchen. ", Annalen der Physik, vol. 322, pp. 549-560, 1905.